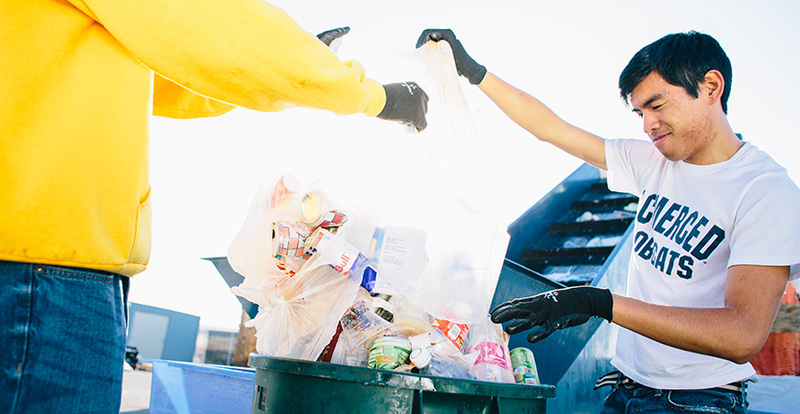 Andrew De Los Santos works in the recycling and composting center to help UC Merced attain Triple Net Zero. When Chigoziri Ibechem attended her first planning commission meeting in downtown Merced last November, she had no idea where it might lead. 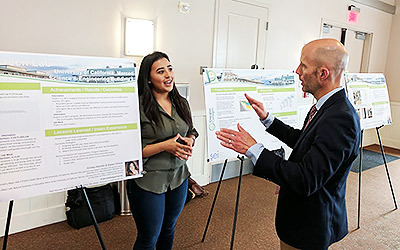 After the meeting, the psychology major from Los Angeles was greeted by the city of Merced’s principal planner, who noticed her enthusiasm for the city’s Local Transportation project. He invited her to apply for an internship program UC Merced’s sustainability office launched earlier this year to give students education and applied learning opportunities in sustainability-related careers. Energize Colleges is a workforce development and training program led by nonprofit Strategic Energy Innovations. UC Merced is one of 12 college and university campuses across California that offer undergraduate students internships through the program to build a qualified workforce for long-term energy and environment solutions. UC Merced is part of a consortium of community colleges and universities preparing tomorrow's energy workforce. Ibechem was one of 29 UC Merced students who were selected for 16 on- and off-campus internships in eight sustainability-related career pathways appropriate for the Merced area, like transportation, building efficiencies and renewable energy. Ibechem’s project focused on increasing walking and biking in Merced. “We really wanted to focus on the locations in Merced that aren’t safe to bike and walk, especially in the disadvantaged communities in South Merced,” Ibechem said. She formed a focus group of community members, and members of the city’s Housing Division and Parks and Recreation. During a meeting in early May, they pored over a map of Merced and gathered valuable input on the transportation challenges residents face. We really wanted to focus on the locations in Merced that aren’t safe to bike and walk, especially in the disadvantaged communities in South Merced. Anissa Abdullah, a chemistry major from Modesto, and Karen Ochoa, a physics major from Oakland, spent their internship working on the Green Labs Initiative with Professor Mike Dawson and Assistant Director of Sustainability Mark Maxwell. The team looked at ways to employ green or sustainable practices on campus, including reducing energy- and water-related costs, increasing safety through the use of smaller chemical quantities, and enjoying longer-lasting lab equipment through efficient use. They found that simple changes — like using recyclable gloves, switching to LED light bulbs and labeling what equipment to turn off when a lab is vacated — could mean costs savings and substantially help the environment. The campus’s reputation and programs are mature enough so that students can really be active agents in the community. The Energize Colleges program helped further solidify Andrew De Los Santos’s goal to pursue a career in the zero-waste field. The senior mechanical engineering major from Los Angeles has been involved with the campus’ sustainability efforts, logging hundreds of hours at its recycling and composting center to help UC Merced attain its Triple Zero commitment to emit zero net greenhouse gases from its buildings and vehicle fleet, produce zero net waste, and to be a net zero energy campus, by 2020. De Los Santos and fellow student Jose Cruz continued research in Professor Gerardo Diaz’s biomass gasification lab looking for faster ways to turn biochar — a biomass subjected to really high temperatures — into activated carbon to create energy reduction. De Los Santos graduated in May and plans to use the experience and knowledge he has gained to work in the Bay Area and eventually earn a master’s degree in sustainability solutions at Arizona State University. UC Merced students interested in an internship in the fall are encouraged to contact Energize Colleges fellow Mark Bachofer at mbachofer@ucmerced.edu.